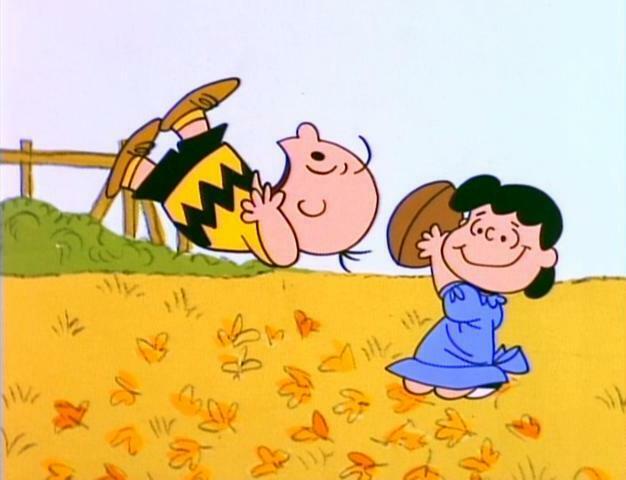 It’s the Super Bowl, Charlie Brown! Okay, first things first: I know my headline isn’t the right title for the Charlie Brown Super Bowl episode. I also know this shot of Lucy pulling the ball away is from a different episode. But they both work and I like them, so they are staying. Anyway, there was a big football game last night if you haven’t heard. For those of you keeping score at home, Green and Yellow beat Black and Yellow, 31-25. One of the funnier side bets I came across was a bet on what color the Gatorade bath will be. Red was the favorite. Should have bet against it. Typical of most Super Bowls, Super Bowl XLV was not just a game, but an experience. What goes in to a Super Bowl experience? There is the game itself, the storylines, the hype, the commercials, the entertainment and, of course, the food. I love the 16 or so Sundays during the year I put the feet up on the La-Z-Boy and watch the Bills, but the Super Bowl is different. I usually watch the Bills alone, or with my brothers. But I can’t remember the last time I watched a Super Bowl alone. It is a social event that transcends the restrictions of normal sporting events. …there are a lot of people who do not know the difference between a blue line and a clothesline. It’s irrelevant. It doesn’t matter. Because what we have at hand, the rarest of sporting events. An event that needs no buildup, no superfluous adjectives. I’m trying to withhold a bad joke about the irony of “no superfluous adjectives,” but I think you get the idea. It’s more than football. The key to a good experience is watching the game with good friends and eating good food, but that’s about the only variable you can control. Everything else is in the hands of the players, the NFL, the performers and anyone with $1 million for a commercial. The game itself was a good one, and the experience was an enjoyable one as well. But when you look at it, SB XLV is a great example of a whole being greater than the sum of its parts. Now that I think about it, I’m not sure I can say anyone had a great day. It didn’t start well. Christina Aguilera botched the National Anthem. Give her a break, she’s only heard it a few hundred times. Ronan Tynan for XLVI, anyone? How about the Packers or Steelers? Pittsburgh had three turnovers and Green Bay nearly blew an 18-point lead. Let’s keep looking. James Starks? I’m really proud of the guy and he ran well, but his final numbers were nothing special. It’s awesome a WNY guy started in the SB and averaged 4.7 yards per carry, but he had 11 touches and totaled 52 yards. That’s not a phenomenal day. Jordy Nelson? His final line of 9-140-1 looks good, but how many balls did he drop? Could have been seriously costly. Ben Roethlisberger looked like a soccer player out there. Ouch my leg! Next play, 18-yard run. Oh, and he did bad things in a club bathroom last summer. Greg Jennings had two touchdowns. HE PUT DA TEAM ON HIS BACK. Or he had four catches. Your call. This video contains vulgarity. Please be forewarned if you choose to play it. The Volkswagen Passat? The Darth Vader commercial was really funny. Know what’s funnier? The car won’t be available for purchase until July. And the kid has never seen Star Wars (<– commercial video there too). The Black Eyed Peas? Don’t make me laugh. At first I was like, “Oh no, Fergie’s microphone is too quiet.” Then I was like, “Oh no, her microphone is too loud.” The Peas came on my iPod earlier while writing this, and I couldn’t take it. I had to change it. And how about the NFL selling tickets that didn’t exist? That’s so embarrassing. Word is they repaid the 400 ticket holders either multiple times face value, or $2,400. Only problem is many bought those tickets second-hand for way more than that (plus airfare, hotels, etc.). I don’t care if the NFL brought them on the field after the game or that it gave them free tickets to next year’s SB. That was pathetic. Shaun Suisham. That field goal missed by what, 30 yards? It was from 52 yards out, but he’s an NFL kicker. I’ve hit from 40. And speaking of embarrassing, I wonder how Alex Rodriguez feels right about now. I’m a die-hard Yankees fan and I’m wearing a Yankees hat right now. But even I was embarrassed for this guy. If that was me being fed popcorn by Cameron Diaz, I’d be bragging about it because I’m a regular person and that is a hot, blonde actress who happens to be rich and famous. But A-Rod is a somebody, and he can get any woman he wants. No amount of money or time spent with a hottie can heal that embarrassment. Lastly, who on Earth dressed the commentators last night? Joe Buck and Troy Aikman did not look sharp. Neither did anyone in the studio at halftime. This is the Super Bowl, people! How do you not bring your ‘A’ game? Really, Joe, with that plaid shirt? Really? Honorable mentions: The Steelers defense, sideline reporters, people who watched Glee after the game, pizza delivery people, anyone that would have won his squares pool if Pittsburgh kicked the extra point instead of going for two, anyone who made apparel in advance that said “Steelers 2011 Super Bowl Champions” on it, chickens that got used for wings, and Brett Favre. So who were the winners of SB XLV? Television. A record 111 million people tuned in to FOX for the game, reports say, meaning you made up .0000009 percent of the viewing audience. Aaron Rodgers played pretty well, and won the MVP award. He wasn’t fantastic, but a lot of his good throws were dropped. Usher Raymond IV (and to a lesser extent, Slash), simply for the fact that the Peas shut up when it was his turn to perform. Slash would get more credit if Fergie didn’t have to sing/howl along to his song. Whoever choreographed the dancers at the halftime show. I don’t know (or care) enough about the technical aspects of the dancing and patterns, but I liked the light-up people. Nice touch. Ticker tape. I always wanted to have the confetti stuff showered upon me. I wonder how much it costs to buy all that tape. Some kids in Mexico probably worked really hard to make it. John Madden. I guess if you have your own video game, you too can sit with the former president at the Super Bowl. Or is the real winner here George and Laura Bush, who got to sit with Madden? I don’t hold the texting thing against him. I assume he used his phone at some point during the game, and that’s just the shot they used. Not the same as A-Rod. Multiple places online say that Madden and Bush have sat together at games before. Interesting. Any town that had a player playing in the game. Like Nick said, that is absolutely something to take pride in (read that!). The NFL Rules Committee. Phew, we never had to try out those new overtime rules! People wouldn’t have known what was going on. It seemed like someone was getting injured every series. That was nuts. That can’t happen. I like the idea of watching more football, but not at that expense. I’ve been injured before, and I wouldn’t wish that on anybody. This is a reminder that, oh by the way, I hope there’s football next year. I’m going to miss it.